Vancouver Island is approximately 525km long and 150km wide. (325 X 90 miles). The Island is split by mountain ranges that run the length of the island topping out at 7,000 feet in Strathcona Park, the island’s largest protected area, 2/3 of the way up the island from Victoria, the provincial capital sitting on the southern tip. Most of the population is clustered around Victoria at the southeastern tip of the Island, 75km as the crow flies from Vancouver, the economic capital of British Columbia, is a metropolis of 2.5 million at the mouth of the Fraser River, at the base of the Pacific Northwest’s coastal mountains. A string of communities are dotted along the Island’s East Coast for 400? Km/250 miles. Mostly they are coastal communities where the islands forests share harbours with the marine industries of a new age economy. Fishing boats compete for space with whale watching boats and kayak rental floats. Mountain ranges that split the island from tip to toe protect a languid, Mediterranean coastline. Highway development is leaving remnant road systems quieting to bicycle speeds. Forests on both slopes of the “Hump” are criss-crossed by old logging roads and emerging trail networks for the off-road enthusiasts. The west coast is wild rainforest and open Pacific. Unique communities cling to spectacular scenery and eccentric weather. A sporting climb from both sides, the road tops out at 375 metres (1230 feet). Backroad Map & Outdoor Recreation Guide. Pacific Rim Informative Adventures Ltd.
A current map of the island includes core details for 14 cities on the island. Gulf Islands, Sunshine Coast, major roads, ferry connections, parks, and regional “context”. Good map for planning multi-day tours or targeting regions for short trips. Published by Davenport Maps of Victoria in consultation with the Greater Victoria Cycling Coalition (GVCC), an excellent model and essential resource for resident or visiting cyclists. It’s a road map colour coded for bike lanes, commuter and touring routes covering the major cycling routes on the south island, from the capital to the Cowichan Valley wine country. A volunteer series with a professional polish, 3 maps cover 3 distinct cycling ecosystems that embrace Victoria. The first covers urban anchored loops around a most liveable city edged dramatically by its coastline. A second maps rolling pastoral roads of a flatter, sheltered peninsula of small farms, beautiful gardens and neighbourly communities. The third covers the hillier fringe of the southwest coast of the island where Victoria’s suburbs recede into the rainforest. Loops for an easy 20 km or 80 km day rides are colour coded and text supported. Published by the Carmanah Forestry Society. Proceeds to the Carmanah Forestry Society.This map covers the southern 2/3 of Vancouver Island. It identifies: Mountain designated mountain biking facilities in 24 locations over hundreds of square kilometres. The map also details hiking, kayaking, parks and protected areas. Carmanah Walbran Park, an old growth coastal rainforest is featured. Map of the largest island in a group sprinkled in between Vancouver Island and the British Columbia mainland. Map identifies routes and features, hills, distances, trails, parks, services, natural and local history and details Ganges, largest town on the island. 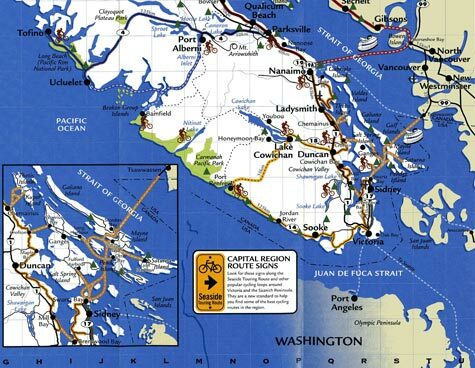 Basic road map of all southern Gulf Islands from Victoria to Nanaimo, 120 kilomtres north of the capital. Detail map of south island north of Victoria includes street index, wineries, info centres, golf, boating, logging roads, hiking trails, campsites and marinas. Useful for planning road and off road routes and facilities. Duncan is a town 50 km north of Victoria in the Cowichan Valley. Detailed road map for planning and exploring the many backroads of the area. Includes details of city of Duncan plus towns of Ladysmith, Chemainus and Crofton plus adjacent Gulf Islands. Also details Shawnigan Lake, Cobble Hill and Arbutus Ridge, smaller communities south of Duncan. Whistler is a ski resort with extensive summer mountain biking programs and networks of multi-use trails. Sunshine Coast region is a useful accessory to multi-day tours incorporating Vancouver Island. Accessible by ferry from Vancouver and from Vancouver Island, the Sunshine Coast is an option as a circle tour. It parallels the east coast of Vancouver Island north of Victoria and is home to a series of small communities, and extensive off-road facilities for mountain bikers. Hartland is a dedicated system of beginner and expert mountain bike trails 15 kilometres from downtown Victoria. Trails have been built and are maintained by SIMBS volunteers to a high standard. 20 kilometres west of Victoria a network of trails have been mapped by local designer Dan Cammiade. It mirrors the SIMBS style and content. Free from the Capital Regional District Parks Dept. The “Goose” is a backbone trail that connects 50 km to Sooke, a destination community west of Victoria and a gateway to the west coast of the south island. Also detailed is the Lochside trail and road links to the mainland ferry terminal and Victoria’s airport. The map details features and distances on this integrated rail trail system. Cycling British Columbia – by Paul Wood, 188 pages. $22.00 + shipping. Includes Vancouver Island and other routes around the province. Touring loops covering British Columbia, Washington State and Oregon. More info to follow. The book sketches out routes and provides information on camping options for the more budget minded traveller. This book is aimed at car travellers, but it is a valuable accessory for anyone interested in thoroughly exploring the Island. It has some helpful route maps and descriptions, as well as history, geography and weather information that will interest the cycling visitor. 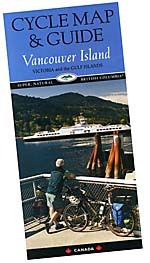 A complete mapbook of the island and info on mountain biking, wilderness camping, fishing, hiking and paddling routes. A great resource for destination mountain bikers looking for the hot trails of British Columbia. Includes basic trail maps, route and parking information for major trail systems for Victoria, Nanaimo, Parksville, the Comox Valley and Campbell River. Also info on camping and the author’s favourite beer stops. This books includes information on family trails and the rough stuff. Maps, route descriptions. Here’s some indispensable information for those visiting the Island. Maps and complete descriptions of native plants and animals found on Vancouver Island. We have an abundance of nature. Vancouver Island has dozens of local off road facilities cut and maintained by mountain bikers all over the region. Local bike shops often carry rudimentary trail maps hand-drawn by local enthusiasts and photo-copied for free distribution. Research into bike shop locations along the island will identify the many shops serving cities and towns all over the island. A phone call, email or dropping in will tell you who has local or regional maps. The Vancouver Island Cycle Tourism Alliance (VICTA is working to inventory maps available for bicycle tourists and other active travelers to the Island and the region. Our list is by no means complete but does feature some of the important map products currently available. Work will continue on building the inventory. VICTA hopes be a catalyst for the development of new map products to provide useful information for local and visiting cyclists. Please share your knowledge with us. We’d be happy to incorporate new information into our product list. Some maps are available through VICTA. Others may be found by contacting publishers or distributors directly. VICTA is currently working on identifying web based resources for useful maps and other planning tools to support your tour or visit.